When Philanthropy Northwest began exploring the relationship of philanthropy to democracy in 2014, Daniel Kemmis wrote, "We find ourselves in the midst of an extended period of fairly acute and widespread uneasiness about the health of our democracy." Those words seem to ring even more true today. In the last two weeks, we have heard statements and seen actions challenging our democracy on a whole new level: a ban on vetted refugees and travelers from seven Muslim-majority countries; the disappearance of any mention of LGBTQ people on the White House website; proposed restrictions on women’s reproductive health and rights; reduced access to affordable healthcare; and new threats to our Native and public lands, to name just a few issues at the core of our network's values. Yet it is also heartening to see hundreds of thousands of people around the country exercise their rights to assemble, to protest and to express their opinions. This is what democracy looks like. When Philanthropy Northwest embraced equity and inclusion in our strategy framework, it meant we would seek to address injustice and encourage honest, thoughtful and respectful dialogue among our members — regardless of political perspectives. We have always talked about philanthropy as a convener and a champion of democratic process. How are you partnering with your communities in response to these challenges? How are you using your influence? What do you want to learn from your colleagues? What do you want to share? Philanthropy Northwest stands ready to help you connect and discover how to best support a healthy democratic process in these times. 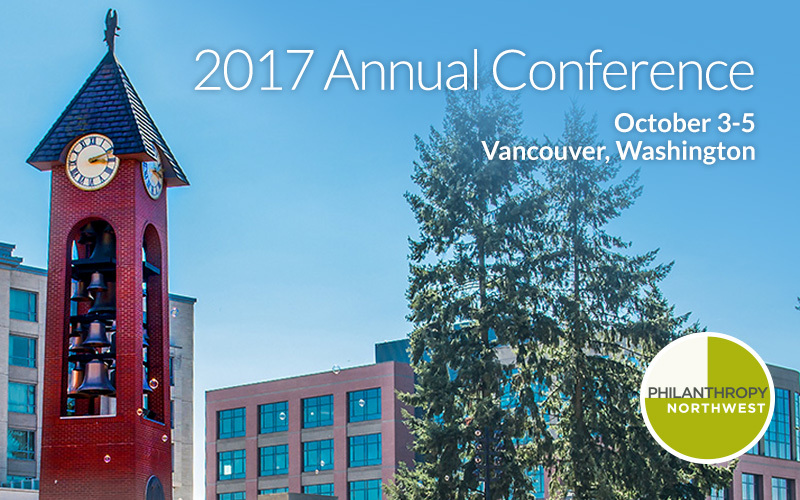 Along the banks of Cascadia's longest river, home of the Cowlitz Indian Tribe and the Northwest's oldest apple tree: Vancouver, Washington will host Philanthropy Northwest's 2017 Annual Conference! On a recent site visit, our program team loved meeting with our partners from M.J. Murdock Charitable Trust and Community Foundation for Southwest Washington and making new connections while enjoying Vancouver's vibrant streets, beautiful landscape and small-town charm. Early-bird registration for Philanthropy Northwest members opens in March. For more information about sponsorships opportunities and session recommendations, please reach out to Lyn Hunter, senior program manager. Audrey Haberman in interim CEO of Philanthropy Northwest and managing partner of The Giving Practice, our national consulting team. She can be reached at ahaberman@philanthropynw.org.